Push hands is a powerful skill to help you learn internal power principles that will help you fight with Tai Chi- but in order to truly do so, you need to learn how to step with it. 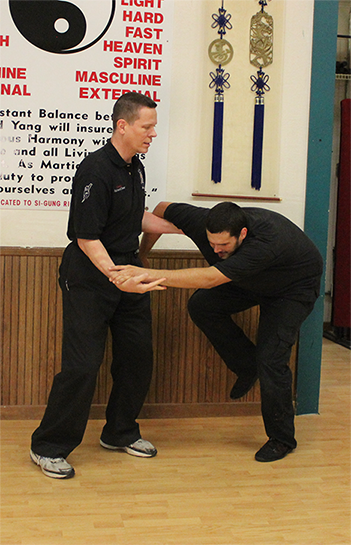 You will move and play with the same positioning you’d fight with to help build the ability to translate your Tai Chi skills into real self defense ability. We will teach you how to bridge the gap between push hands and fighting. You will learn to maintain your internal principles while moving quickly on your feet. You’ll learn how to make your partner overextend while keeping yourself connected and balanced. Meanwhile, you’ll practice controlling distances and learning the different fighting ranges. We will show you how to use all of your internal power principles against an opponent who is compensating externally (the way it WILL be in a real fight). These drills will help you maintain your connections in movement, and under pressure in the chaos of the moment. These skills are necessary to fight with Tai Chi! Add these stepping skills to other Internal Power skills you have already learned to see how Tai Chi truly fights!